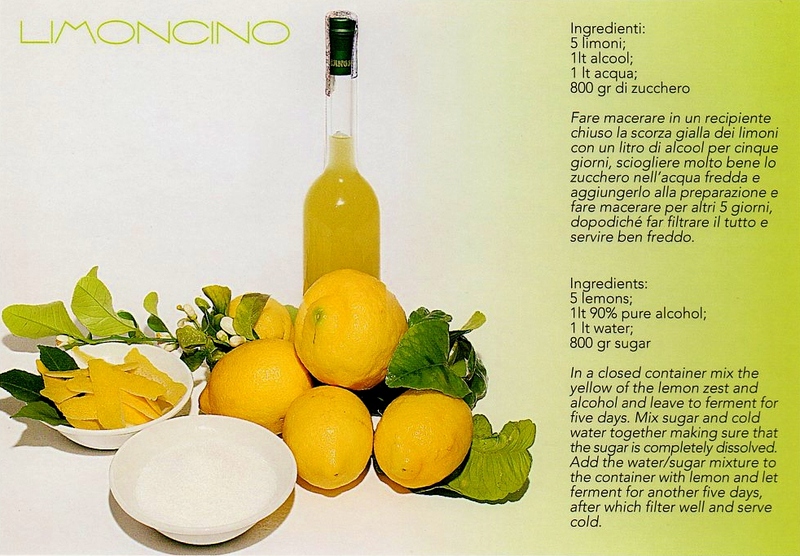 Although this recipe purports to be for Limoncino, that is in fact just the Ligurian name for the better known Limoncello, an after-dinner lemon liqueur produced all over Italy, although especially in the south. As you can see from the recipe on this postcard, it’s rather simple to make (although I must confess I haven’t yet tried making it at home) and my flatmate’s grandfather down in Puglia, the region that forms the heel of Italy, makes it himself. So we had this delicious homemade liqueur all the time! Although it should really be tasted and fully appreciated in Italy, it is possible to buy Limoncello in the UK supermarkets, for example in Waitrose for £13.50. I picked up this postcard in the Cinque Terre, which are five tiny seaside villages on the north-west coast of Italy, in Liguria. Also see my previous post on Vernazza, one of the five villages.